In this episode of iQ: smartparent learn all about fitness – with a digital twist! Experts reveal the newest technologies that support and promote health and fitness. Build healthy habits for the 21st century on this episode of iQsmartparent. Dr. Ellen Beckjord is an Assistant Professor at the University of Pittsburgh in the Biobehavioral Medicine in Oncology Program at the University of Pittsburgh Cancer Institute. Amanda Budzowski is the Health Coach of Training & Quality Assurance for UPMC Health Plan. 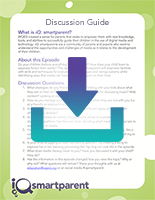 Download the award for this episode to show that you participated in the discussion.